WILLIAMSTON- The Williamston Farmers’ Market continues into the fall season as vendors and customers travel as far as Ann Arbor and Grand Rapids to find their source for locally baked, farmed and crafted goods right in the parking lot of the newly renovated McCormick Park. The market takes place every Sunday from 10 a.m. to 2 p.m. beginning in mid-May to mid-October. One frequent artist at the Farmers’ Market is market board member Christina Miteff. Miteff travels the state for her handmade jewelry and art brand: Creations With Color. Miteff said that a lot of customers come to the market for cheese. The Cheese People of Grand Rapids provide the market with the cheese that has brought many customers from surrounding cities. Miteff said that Williamston is definitely a bedroom community. Miteff also said that many people come to the market that are not from Williamston. 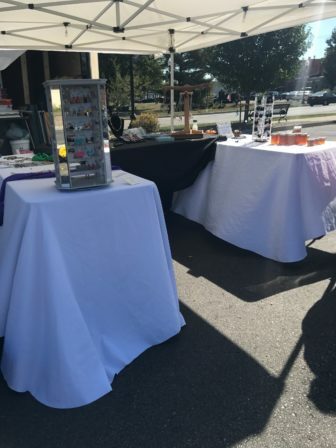 Christina Miteff’s handmade jewelry and art brand Creations With Color has a large booth set up for the market every Sunday. Market director Marlene Epley said that the most popular items at the market vary by week depending on weather and harvest. Within the month of September, Epley reported that seasonal crops such as pumpkins, watermelon and apples have been very popular. In addition to the seasonal favorites, the market offers a range of products that also bring interested customers to Williamston. Lansing resident Katlin Niedzielski said that she has traveled to Williamston after hearing about the market. 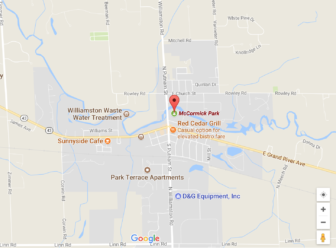 Niedzielski said that every Sunday people make their way to McCormick Park. Niedzielski said that she plans to go back again soon for more produce and goods. Miteff says due to this popularity it takes a few hours to set up the entire market; beginning around 7 a.m. and starting promptly at 10 a.m.